The New Mountain weather station instrument is the only all-in-one weather sensor that calculates apparent wind speed and direction, barometric pressure, air temperature, relative humidity, dew point and wind chill temperature. With the optional internal compass and Global Positioning System, true wind speed and direction can also be calculated. 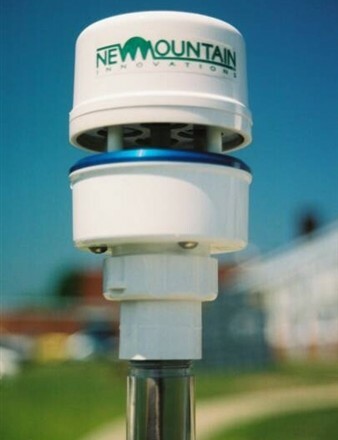 The UV stabilized, compact housing is fully waterproof and resistant to chemicals. 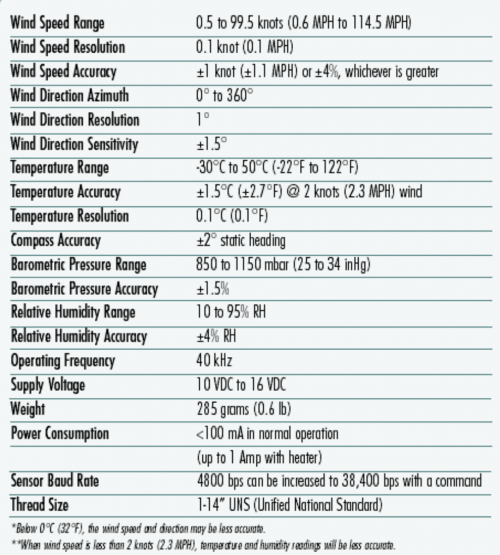 The NM 150 Weather Station Instrument comes with our exclusive Weatherview32 Software. Data can be viewed in both digital and analog format and can be saved for a set period of time. Data can be accessed from other computers as well as uploaded to host sites such as weatherunderground.com Standard NMEA sentences and an RS485 interface allows for the flexibility of designing your own software program to fit your specific application. Our comprehensive technical manual makes the job easy! The weather station contains four transducers, visible through the four holes in the top of the sensor’s wind channel. The transducers operate in pairs- one transducer injects a pulse into the air, and the other (directly opposite) listens for the arrival of that pulse. Each pulse bounces off the anodized aluminum plate at the bottom of the wind channel and is carried by the wind to arrive at the opposing transducer a short time later. When there is no wind, the pulse travels at the speed of sound from the sender and receiver. Whenever the wind is blowing in that direction, the pulse will arrive sooner than if the air is still. 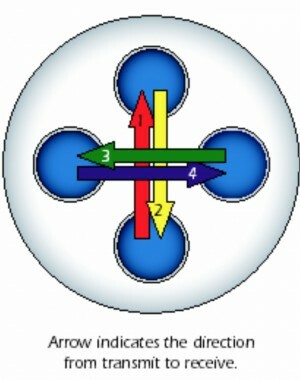 The four transducers take turns in sending and receiving pulses to cover all eventualities of wind direction. A built in microprocessor combines the measurement from all four transducers to calculate the resultant wind speed. New Mountain Innovations, Inc (NMI) discovered and patented Acoustic Larvicide, where mosquitos larvae are killed with acoustic energy. This technology has already proven to be environmentally friendly and target specific.